← Can We Change the Future of Aging? I like to explore new things. This probably comes from spending 30 years involved with technology. Take cell phones, for example. I am always looking for the newest, coolest, fastest, etc. My smartphone has become my constant companion with a wealth of tools that aid my everyday living and organization. 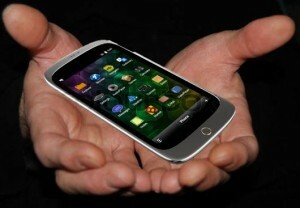 Calling it a phone seems like a misnomer. It tells me where to go, how to get there, and where I’ve been. It shows me the weather, takes pictures and videos, captures my thoughts, and gives me music as well as wonderful ideas through podcasts and audio books. And having an Internet browser in my pocket allows me to settle debates between me and friends, and lots more. I have been using such conveniences for several years now. My wife, on the other hand, does not embrace such new ideas with the fervor that I do. She is more reserved in exploring new paths. Her motivation for the new is tempered by the fact that the old still functions. Or does it? In the past year, she has joined me in utilizing her smartphone in truly useful ways that noticeably adds to her daily life. After seeing how I have been using my mobile devices, she has followed suit to get some of the same benefits that I have enjoyed. I classify myself as an “early adopter”, while Deb calls herself an “early majority”. Those are strange terms so let me explain them, since they, along with a few others, form the basis for this article on improving our culture’s aging characteristics (as previously discussed here and here). There is a fairly established social science theory called the “Diffusion of Innovation” that explains how new ideas, tools and concepts become accepted as mainstream thinking over time. According to the theory, a population can be segmented by the characteristics in which they embrace change. First there are the innovators. These are the people who may actually be creating the change or innovation. 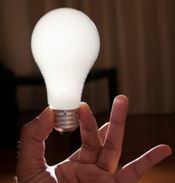 Studies indicate that these innovators comprise of about 2% of a typical population. Then there are the early adopters. These are the people that typically embrace change opportunities and are already aware of the need for change, which makes them willing to explore new ideas. According to theory, this segment is about 14% of a typical population. After that, comes the early majority. These are the people who will accept new ideas after it has been confirmed to work, or after they see evidence of the promise that change will bring. They want to see the effectiveness of the change before they adopt it. This segment is estimated to be about 34% in a typical population. The late majority segment follows next. Typically skeptical of change, they adopt transformation only after it has been successfully tried by the majority. This group is about 34% of the typical population. And last are the laggards – those that are usually bound by traditions and very conservative. This group will be about 16% of typical populations. The Diffusion of Innovation theory is very useful in helping us understand how new ideas and paradigms are introduced and become accepted in our cultures. The entire process of idea acceptance can take a short or long period of time. And there are factors that determine just how long an idea will take before it is universally accepted in a population. But explaining that is beyond my purpose in this article. In short, there are a lot of new ideas, concepts and possibilities that are pointing us toward better aging. 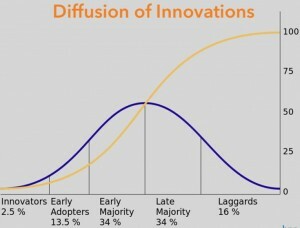 And as the “Diffusion of Innovation” theory tells us, these new ideas will first pass through the innovators, then early adopters, then early majority, on to the late majority, and finally take in the laggards. This could still take a very long time to be diffused in our cultures. The process needs to be expedited if we would like to see the benefits in our longer lifetimes. So let’s take a quick peek at some of the ideas that will create a new aging model for our culture. The ability and willingness to tolerate an aging body increases as we age. An AARP research survey confirms that close to 69% of people 70 or older feel that their physical health does not hold them back from doing what they want to do. This thought shift can be helpful to those of us who fear our own aging. Growing older is not an obstacle to overcome. Instead, it is a part of life where our experiences and lessons are used to activate new opportunities and strengths. Although growing older is a physical process, getting old is a mental and spiritual one heavily influenced by our culture and its stereotypes. As the now famous Langer experiments confirm, our expectations and mindset about getting older is one of the largest factors that cause us to set limits on ourselves as we age. Each stage of life from infancy to elderhood is equally significant and necessary for the welfare of humanity. Each stage of life has its own unique “gift” to contribute to the world. Our cultural challenge is to realize the value in each stage enough to use the gifts offered by them. Many elements and aspects of our culture teach us to needlessly fear our aging process. Young and middle aged people have a rather negative idea of what getting older will be like. These opinions affect them throughout their lives as they approach these older years. They tend to become what they fear. But social research shows us that our negative stereotypes of aging affect only a minority of our elders. These are just a few of the new (and not so new) ideas that are beginning to spread through our culture. These are all deceptively different ideas than the previous set of ideas we have used to understand aging. The future of aging, in part, rests with the spreading of a new set of ideas and ideals. So, according to the Diffusion of innovation theory, we need to find our society’s early adopters, who will then influence our early majority to spread the above approaches to the next level in our culture. Through their examples, they will inspire the rest of us to see growing older differently than we do now. The “Silver-Inspirations” (early adopters) among us will point the way to better aging characteristics for our entire culture. Through their examples, we will all eventually understand what is possible and what we can strive for. They will show us better ways of enjoying and giving during our final chapters. These “Silver-Inspirations” will motivate the changing norms of getting older in our culture. Yes, the images of getting older are indeed changing. And Silver-Inspirations are at the heart of that change. Although most are unseen, they serve as our role models and guides as we envision the possibilities ahead for us. These Silver-Inspirations may only be 14% of the population, as the Diffusion of Innovation theory goes, but they are becoming more and more visible around us. Indeed, you may be one yourself, or you may know of one in your personal environment. How would you recognize Silver-Inspiration people? They are exposed by the lives they lead and where the focuses of their pursuits are. Some are legends, but most are not. Most are ordinary people that exemplify the principles of better aging in and around them. To see if you, or someone you know, is eligible to be a Silver-Inspiration , take this 10 question quiz. It isn’t necessary to meet the majority of these conditions. You will know inside of yourself if you qualify as a Silver-Inspiration. But one of the best measures of whether you, or someone you know, are a Silver-Inspiration is if your family, primarily your children, would say that you are a great representative of what your age should be like. This is solid identification. In this case, you are not only influencing your peers. And you are also influencing the younger generation as well to view aging in a more positive manner. Some have said that I may qualify as a Silver-Inspiration based on many videos on my Youtube channel. I will let others judge that. But the original intent of exposing those videos was to help inspire others to find something in themselves that they too would be proud of, and share that with a larger audience. There are so many around us who have become passive about life because of their age, or because of their aches and pains, or simply because that is what the stereotypes indicate to our inner mind. There are so many that don’t yet know that they are still growing and will continue to grow until they take their last breath (as recent research has shown us). So instead, they stagnate. And many of us have essentially stopped taking care of ourselves, or ceased aspiring to better life conditions, better health, and greater connections. For those of us that fall into this category, Silver-Inspirations are very useful as role models, to show us what is possible in our lives, to show us better ways of seeing and experiencing the rest of our lives. On the flip side, there are enough ordinary people over 55 that are on the road to be Silver-Inspirations without even knowing about it. We may be retired, but still are engaged and connected with life around us. We may still be athletic, extending ourselves to test the limits of our aging bodies, and surprised at how capable we still are. We may be heavily involved in the service of others, creating much needed good in our society. We may be discovering that our aging bodies are not the obstacles we thought they would be in moving forward with our hopes, dreams and aspirations. We may have faced health, financial or business battles, and, at least for now, have won that battle and continue to move forward with a life of purpose. Silver-Inspirations are still involved in the dreams ahead of them. Despite their age, they have much to do before their last breath. They are looking ahead with purpose. Would you happen to be such a Silver-Inspiration? Do you know someone who is? Your story matters. Spread and inspire the passions by sharing your story. Our culture needs to hear from you in order to move it along more efficiently toward a time where we can all recognize that growing older is the ultimate expression of wisdom, as Michael Gelb has suggested. I would love to publicize your story to help and inspire us all. If you can see yourself as a Silver-Inspiration, please write to me telling about yourself. Growth-works would like to help you do even more good by sharing the inspiring parts of your journey with those that rejoice in the learning of it. If you know someone who could be a Silver-Inspiration, share this blog post with them, or write me about them. There is work to do in defeating the negative stereotypes of growing older. We can help our culture learn that growing older is a natural process with its special gifts, not a mental and spiritual decline dominated by the images from our current cultural labels. Let’s hear your stories. Write to me and introduce yourself, for the good of those around you that really need it. This entry was posted in Related to aging, Silver Inspirations and tagged active aging, age-friendly, aging science, aging stereotypes, aging2.0, attitudes about aging, conscious aging, growing old, growth-works, healthy aging, human longevity, Lee Mowatt, life rejuvenation, New Age Aging, positive aging, sociology of aging. Bookmark the permalink.